Audi will run a second hybrid R18 e-tron quattro for Allan McNish and Tom Kristensen for the rest of the season in the World Endurance Championship. The experienced duo have so far raced the non-hybrid R18 ultra at every event this year except the Spa 6 Hours and the Le Mans 24 Hours. But they will now switch permanently to the e-tron quattro for the remaining rounds of the season, starting with Bahrain at the end of the month. Head of Audi Motorsport Wolfgang Ullrich hinted that one of the reasons for the decision was to combat the improving form of Toyota, which took its maiden victory in the championship last weekend in Brazil. "With two hybrid vehicles we're in a better position in the battle with Toyota," he said. 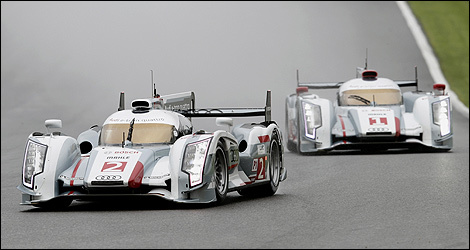 "Our analysis has shown that we've got an advantage in traffic with the R18 e-tron quattro." Team Joest technical director Ralf Juttner added: "In Bahrain we'll hopefully managed to get revenge for Brazil. "We'll leave no stone unturned to return to the top of the podium." Audi explained that the switch will also enable McNish and Kristensen to fight for the championship on equal terms with team-mates Andre Lotterer, Marcel Fassler and Benoit Treluyer, who have raced the hybrid machine in every race except the Sebring 12 Hours. They currently trail the trio by 7.5 points. Juttner added: "We've got to convert car number 2 into an e-tron quattro on location. That's a huge task for the team. "It will make the close battle for the drivers' championship even more exciting because it leads to greater equality of opportunity. We're looking forward to this."